Welcome to The Independent's live blog for the 72nd annual Tony Awards! Ahead of the show, see the full list of nominees for this year's ceremony. Leading this year's ceremony are Mean Girls and SpongeBob Squarepants: The Musical who have 12 nominations each. The Tony Awards red carpet just started at 5pm EST and can be streamed live on Facebook here. Mean Girls has 12 chances to win at this year's ceremony, and Tina Fey will be on the red carpet tonight. We caught the Broadway show recently, and we can honestly say that it deserves these nominations. 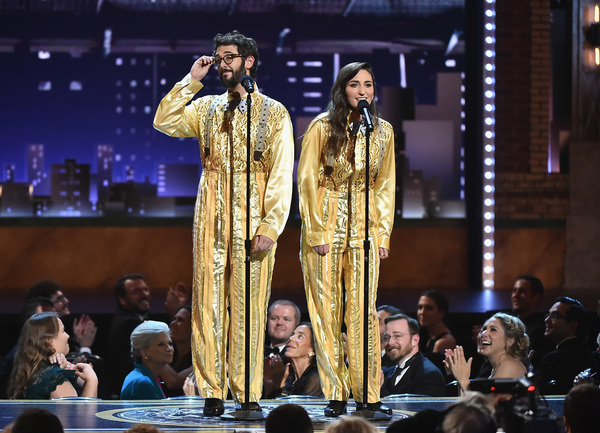 Entertainment Tonight's Denny Directo is hosting the red carpet tonight and just revealed hosts Sara Bareilles and Josh Groban will be performing a musical number tonight. But that's not the only thing he said: Sara Bareilles is working on a new album apparently. 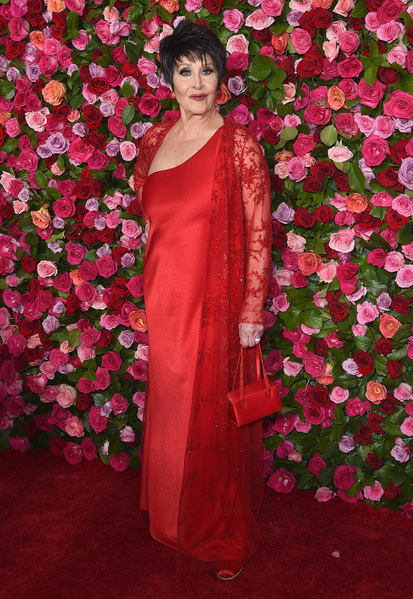 Chita Rivera is the pinnacle of Hollywood glamour in a red, silk gown. The former West Side Story star is "humbled" to be receiving a Lifetime Achievement in Theatre honour alongside Andrew Lloyd Webber. 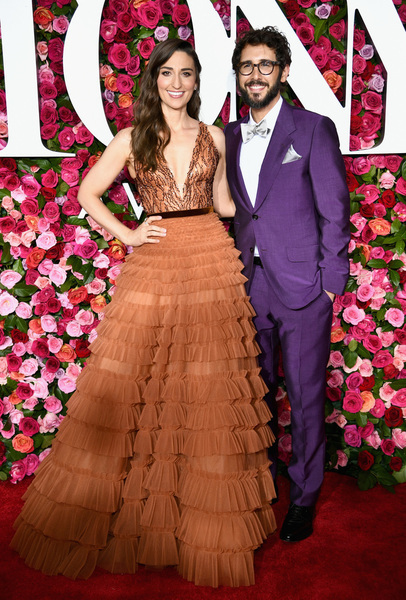 Tony Awards co-host Sara Bareilles glows in a bronze gown with a sequined bodice - one of her many looks for this evening's ceremony. 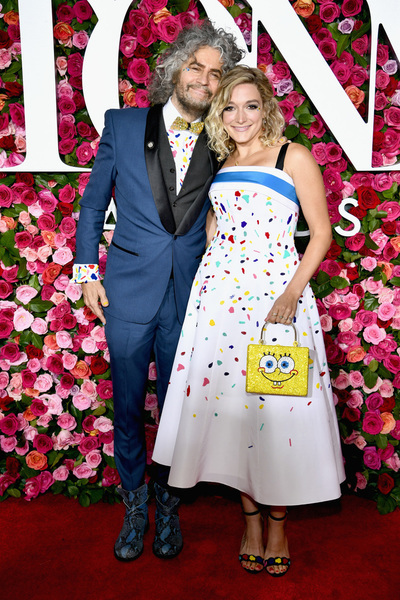 The Flaming Lips' Wayne Coyne and Katy Weaver are wearing "SpongeBob-inspired" looks for tonight's awards show. The Flaming Lips are nominated for Original Score for SpongeBob Squarepants: The Musical tonight. 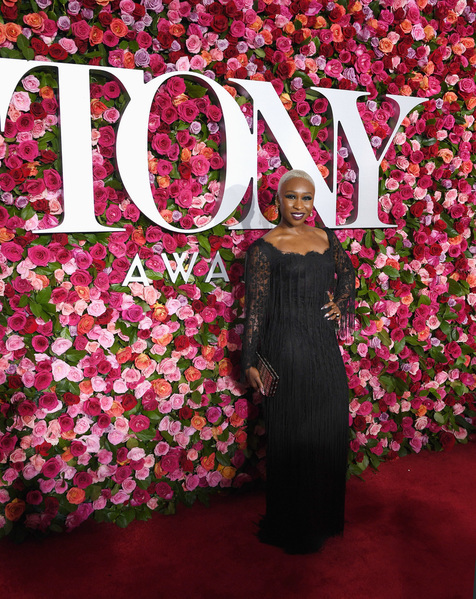 The Color Purple's Cynthia Erivo looks breathtaking in an off-the-shoulder black lace gown with a fitted bodice. 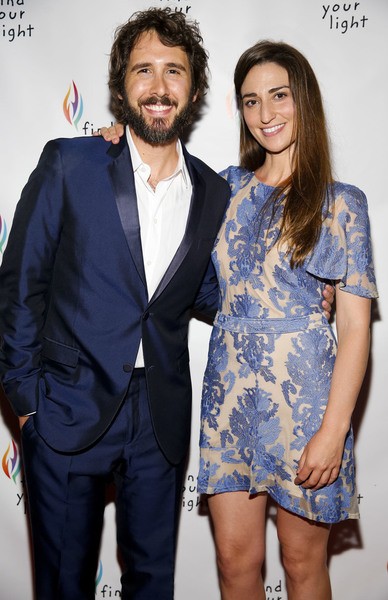 Hosts Sara Bareilles and Josh Groban's red carpet looks complement one another, so they're off to a good start. 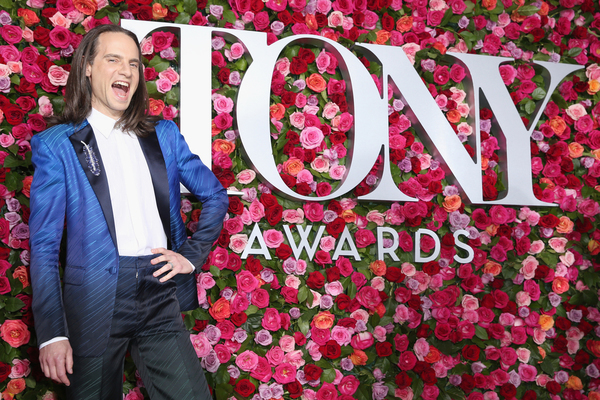 Broadway producer Jordan Roth stole the red carpet in an electric blue Givenchy couture tux. Tonight he's vying for a Tony Award for the Angels in America revival. This will be his fourth win if he takes the award home. 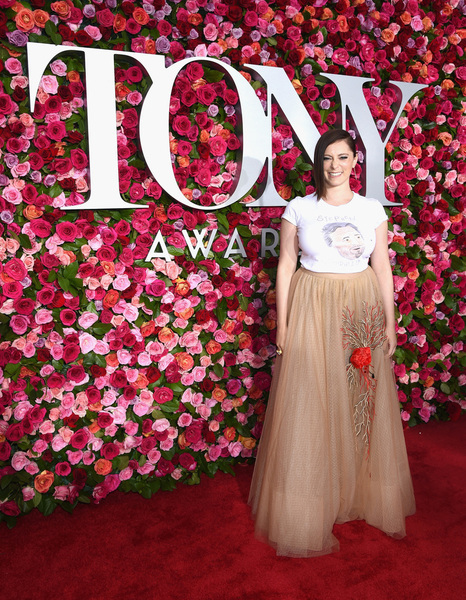 Crazy Ex-Girlfriend's Rachel Bloom dons a Stephen Sondheim t-shirt to show off her musical theatre fandom. Tina Fey leads the Mean Girls charge at this year's awards show with 12 nominations for her hit musical. The show's co-creator stuns in a floor-length fringe-accented metallic gown. 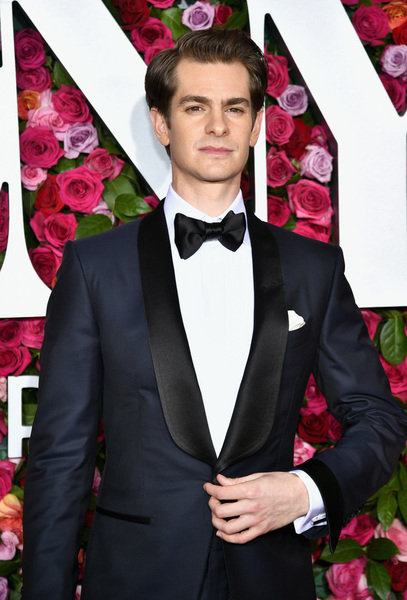 Andrew Garfield looks especially regal tonight on the Tony Awards red carpet. He arrived just after performing a matinee show of Angels in America. Tonight he's nominated for Leading Actor in a Play for his role as Prior Walter in the Broadway revival. It's impossible for Kerry Washington to ever look anything less than perfect. Tonight she shines in a silver gown with a plunging neckline and took time to promote her new Facebook Watch series Five Points, which she's producing. With Scandal's final season wrapped, she'll also make her return to Broadway in American Son. The red carpet looks were mostly stunning, but perhaps the New York City rain made it a bit of a snoozefest. Hopefully the ceremony will be the opposite when it begins shortly. Sara Bareilles and Josh Groban's opening was self-deprecating ode to Tony losers and it was perfect. 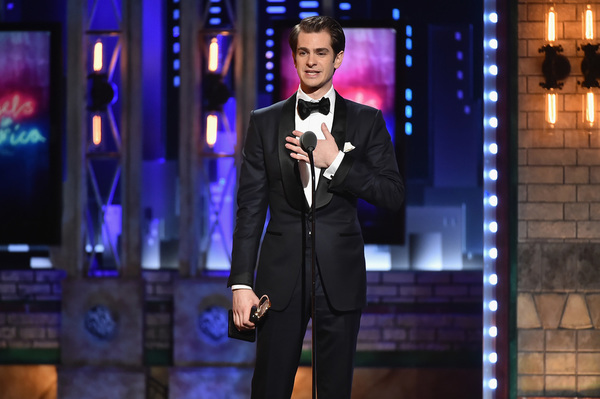 Congratulations to Andrew Garfield for his winning a Tony Award for Leading Actor in a Play for Angels in America. He delivered an emotional speech about acceptance and equality, taking aim at the bakery that refused to serve a gay couple: "Let’s just bake a cake for every one who wants a cake." 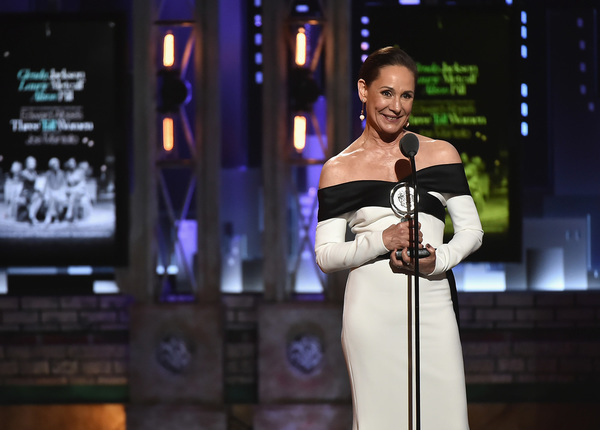 Laurie Metcalf just took home her second Tony Award win - this time for Featured Actress in Three Tall Women. Roseanne may be cancelled, but it looks like Metcalf is finally getting the attention she deserves. Billy Joel's speech presenting a Tony Award to his friend Bruce Springsteen is extremely emotional. What a duo. 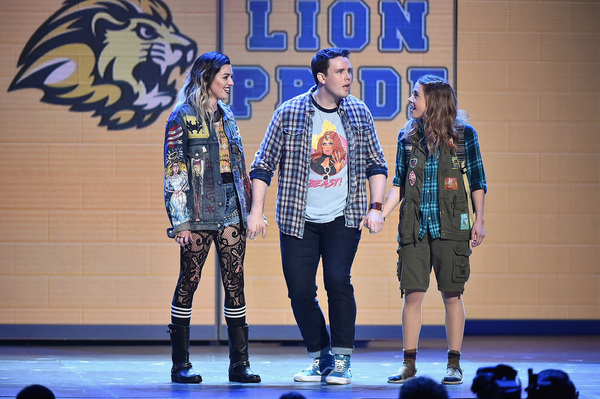 The entire cast of Mean Girls delivered stellar performances of "Where Do You Belong?" and "Meet The Plastics." Regina George's white pantsuit is flawless and so is the cast. 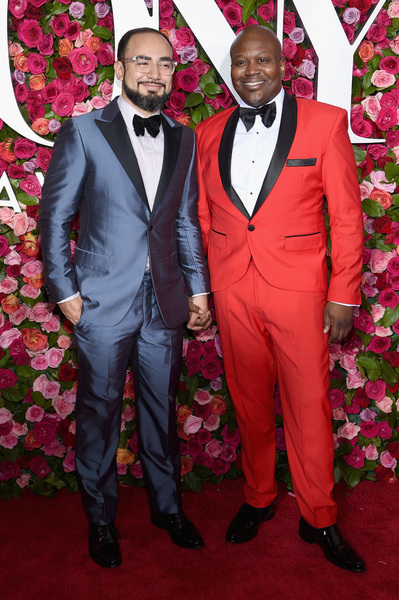 Tituss Burgess should win an award solely for his fierce, red tux. He looks incredible. Sia would appreciate Josh Groban and Sara Bareilles' theatre-inspired cover of "Chandelier." She'd also probably admire their matching gold pantsuits. Nathan Lane is a class act. Congratulations to him on his Tony win for Angels in America! Hopefully there's justice for Mean Girls to come. 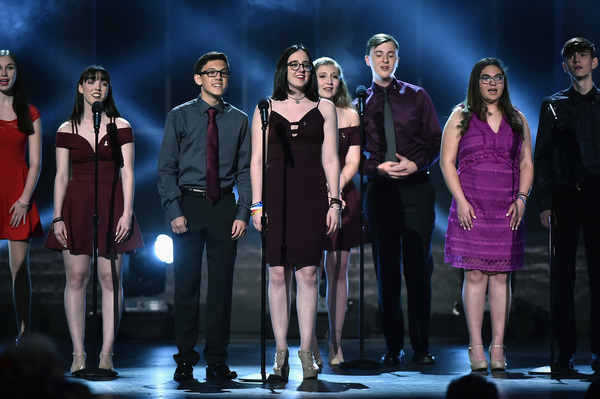 So incredible to see the Marjory Stoneman Douglas students singing "Seasons of Love" from Rent on stage at the Tony Awards. They received a tearful standing ovation. Ari'el Stachel's speech alone about identity should have won an award. 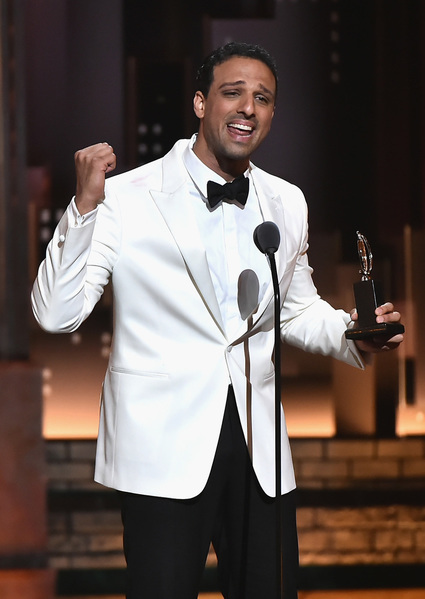 Instead he took home his first-ever Tony Award for Best Performance by an Actor in a Featured Role for The Band's Visit. "Both of my parents are here tonight. I have avoided so many events with them for so many years of my life," he told the audience. "I pretended that I was not a Middle-Eastern person. And after 9/11, it was very, very difficult for me, and so I concealed and I missed so many special events with them. And they're looking at me right now and I can't believe it. I want any kid who is watching to know that your biggest obstacle may turn into your purpose." The Band's Visit seems to be taking home a lot of awards tonight. 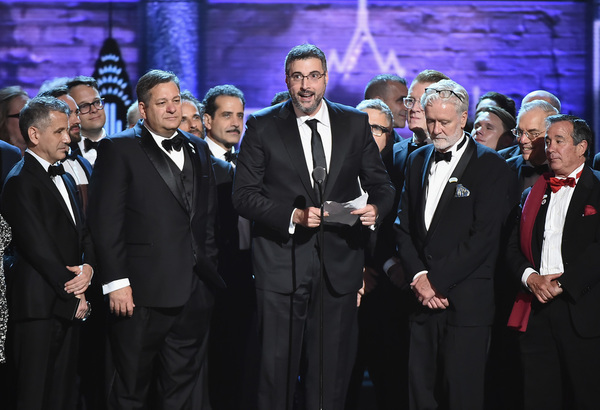 The production has taken home seven nods already: David Cromer won for Best Direction of a Musical, David Yazbek won for Music and Lyrics, Ari'el Stachel won for Best Performance by an Actor in a Featured Role and the list goes on. Gryffindor for the win! Harry Potter and the Cursed Child takes home a Tony Award for Best Play. JK Rowling must be so proud. Donna Summer would be so proud to see the performance of Summer: Donna Summer The Musical. It was just a joyful moment during a ceremony. The Queen of Disco still reigns. Wow. John Leguizamo received a special Tony Award, and he delivered one of the most powerful statements of the night: "I'm a living example of how theatre can change you. It didn't just change me, it saved me." Earlier in the evening he used his time on the stage to advocate for the Latino community and speak out against President Trump. 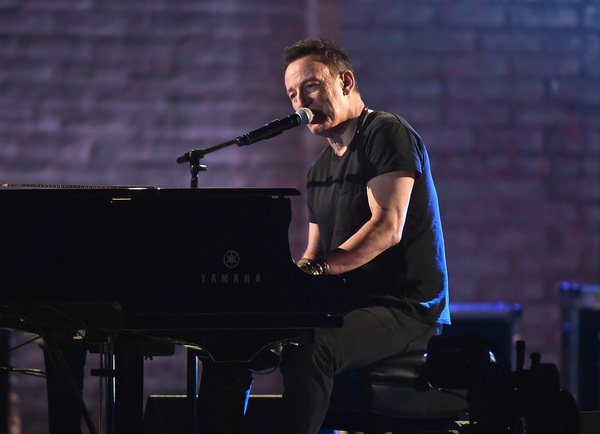 Hearing Bruce Springsteen perform a segment of Springsteen on Broadway is truly poetic. There's so much history there about him and about New Jersey. Robert De Niro used his time at the Tony Awards to denounce President Trump. He said "f*** Trump" and received a standing ovation for his remarks. This comes as no surprise considering how outspoken the legendary actor has been against the president. The Band's Visit officially won the biggest award of the evening: Best Musical. The accepance speech was even better: "In the end we are far more alike than different, and I am proud to be a part of a community that supports this message." Right before this win, Tony Shalhoub picked up a Tony Award for Leading Actor in a Musical and Katrina Lenk took home a nod for Leading Actress. That's a wrap everyone! if you missed anything, take a look back at our coverage.